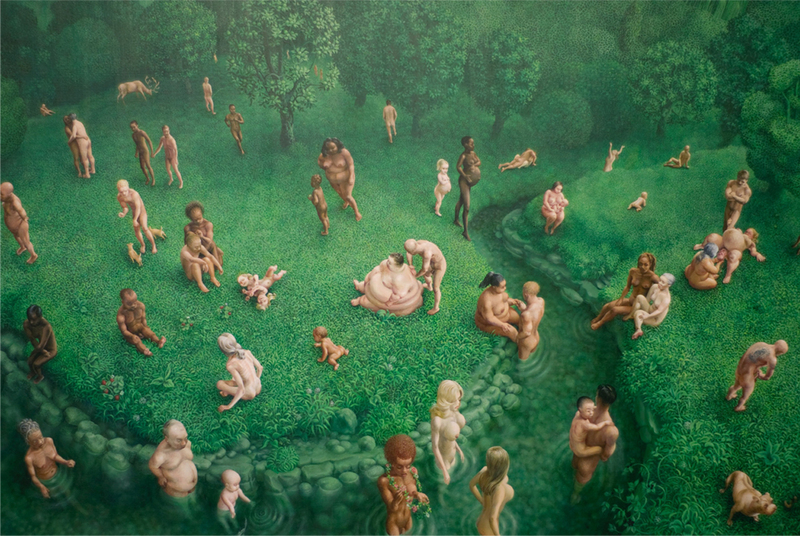 Artist Claire Douglass has re-imagined ‘The Garden of Earthly Delights’ in an extraordinary new painting. Taking 7 years to complete, it’s a contemporary take on Hieronymus Bosch’s famous masterpiece, filled with references to modern day life. 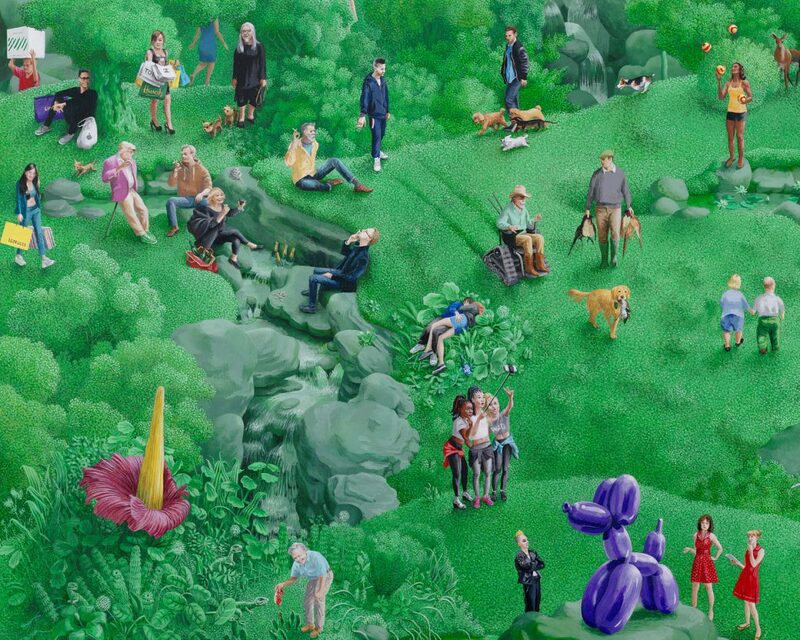 John Lewis bags, selfie sticks and celebrities appear amidst the evergreen landscape. The more you look, the more you see. And the good news for art lovers in Birmingham? It will soon be on show at Centrala in Digbeth, from 3 – 17 November, 2018. The PV will be on 2 November from 6-9pm. Claire began the large 3-panelled painting from a studio in East London in 2011. It was completed in Birmingham earlier this year. The intervening 7 years have seen the work progress into a contemporary representation of Britain at play. It features a multitude of partying celebrities, Wolverhampton Wanderers winning the FA Cup, Lady Gaga with her little monsters, a parade of adult babies and dancing poodles, amongst the 400 tiny figures depicted. “I hope it can be seen as a work of joyous hedonism but also a memento mori for an unsustainable culture on the cusp of great change”. She used a variety of reference for the figures, including photos of friends posing on Facebook. “Some of them probably don’t know to this day that they’re the body doubles for celebrities”. 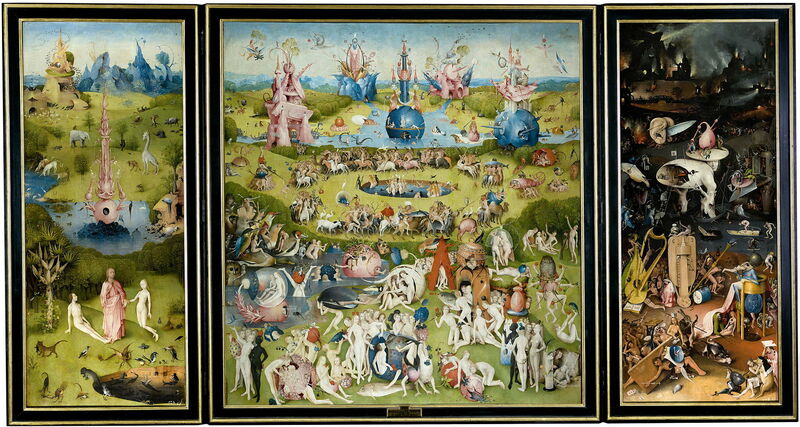 Painted around 500 years ago, Bosch’s ‘The Garden of Earthly Delights’ (ca. 1490 – 1510) is undoubtedly a masterpiece. Today it hangs in the Museo del Prado, Madrid. The large-scale work is an altarpiece triptych, composed of three internal parts and an outer protective case. The artist’s detail-drenched and symbolic narratives dance between heaven and hell. Within biblical-themed landscapes play a revolving cast of fantastical, and often macabre humans, animals, monsters, and make-believe creatures. Many twentieth-century art historians believe that Bosch’s Garden is a moral warning against sexual indulgence, and the perils of life’s temptations. Although, others see it as a surreal panorama of paradise lost. “For the first year I just had a repeat pattern of green landscape that I worked on. Interestingly I never set out to make a version of Bosch’s surreal masterpiece. I thought I was making a contemporary version of Bruegel’s Netherlandish proverbs. A friend of mine stopped by the studio and saw the three panels with a big egg right in the centre panel and said, but you’re painting a Garden of Earthly Delights, it kind of stuck. The figures started to go in after the first year. That was the most daunting bit, I knew how densely populated I wanted the painting to end up”. Alongside the Garden work, Centrala will also show the artist’s exquisite and intriguing painting ‘After Cranach’. This was the piece which Claire worked on immediately prior to ‘The Garden of Earthly Delights’ and it became the catalyst for the way she works now. Based on Cranach’s ‘Golden Age’, Claire conflated his pastoral idyll and her own by the addition of recognisably contemporary bodies. “The painting became a representation of that place ‘over the rainbow’, a haven where humans are free to live without the burden of personal shame”. To find out more about Claire Douglass you can follow her Instagram feed. Her ‘Garden of Earthly Delights’ also has its own Instagram page here. See you by the Garden? P.S Have you seen my new art resources page where I list my favourite art books, gift ideas and more?